Atlus shares new details on story, heroines, and the hero's rival. 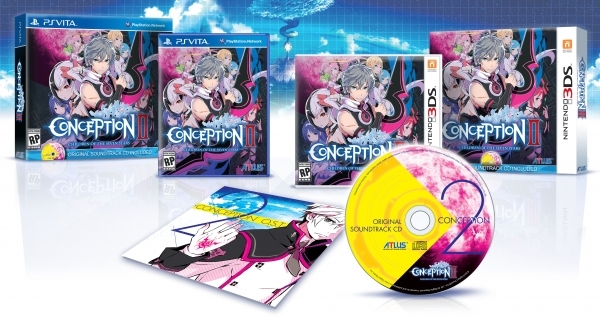 Pre-orders for Conception II: Children of the Seven Stars include a special box and 10-track CD arrangement composed by Masato Kouda, Atlus announced. The RPG, due out for PS Vita and 3DS in spring 2014, puts players in the role of “God’s Gift,” a teenage protagonist “overflowing” with the Star God’s power. He is humanity’s last hope at defeating the monsters spawning from the Pandora Labyrinth. Outside the pre-order announcement, Atlus also shared details surrounding the game’s story, heroines, and rival character. The hero is told about his ability on his first day of class. He is joined by Fuuko—one of the game’s seven heroines, and the girl who make’s the hero’s first Star Children—and Chlotz, your “awkwardly endearing” best friend, and a natural third-wheel. Throughout you’re daily studies, you’ll meet the other heroines you can take into dungeons with you. Successful conversations earn you “Bond Points,” which you can use to create Star Children. Each have different personalities, so you’ll have to watch what you say—’less you make them angry. The stronger the bond with your partner heroine, the more powerful she is in the labyrinth. There’s also a rival character. Alec was the top student before you showed up in school. He’s described as “pompous, arrogant,” and from a rich family with “untouchable influence.” And he is “quick and eager” to gain his position back.